What's So Good About Korea, Maarten? 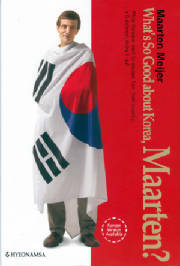 Maarten Meijer's book "What's So Good about Korea, Maarten?" was recently published by the Korean publisher Hyeonamsa, both in English and Korean. As far as we were told it is the first book about Korea by a Dutchman published locally. The book was received favourably by the Korean media. There were special programs and articles about the book and its author by Arirang-TV, KBS-, EBS-, and CBS-radio, The Korea Times (2x), The Korea Herald, Infomag Magazine (the monthly magazine by the EUCCK), Chosun Ilbo, Kookmin Ilbo, Jugan-Donga (Donga Weekly), the popular Korean monthly "Positive Thinking," Topclass magazine and http://www.coreafocus.com/. In addition the book was classified as "recommended reading" on the Korean Government Publications Ethics Committee website which means that amongst others it will be made available in all public libraries. The book can be found in most major bookstores such as Kyobo, Youngpoon and Bandi and Luni (COEX-mall). It costs KRW 12,000 and Kyobo classified it under "top-selling books about Korea." More information can be found on the author's website www.maarten.cyworld.com.